Today is Chinese New Year, and this year it is the year of the Monkey. So we thought we would look into what that means. Chinese New Year is celebrated at the turn of the lunisolar of the Chinese Calendar. It is also a Spring Festival. It is a centuries old celebration, and is celebrated all around the world these days. Although London has one of the largest celebrations outside of China. The History of the festival is based on the legend of a beast called Nian, who was quite partial to eating villagers, especially children!! So, the villagers started to put food in front of their doors for protection. Naturally Nian would eat the food and then not eat the children. Aparently a God visited one of the villagers and told him to put red paper and set off fire crackers. So, the villagers took that to mean that Nian was afraid of red, so they would dress in red, hand red lanterns and hang red scolls on windows and doors. The then started lighting fire crackers to scare Nian. Which seemed to work. Each Chinese New Year is represented by one of the 12 animals in the Chinese zodiac. 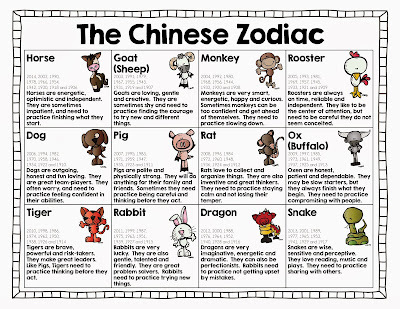 The chinese zodiac is very similar to the western one, except each sign is a year in stead of a month. The monkey is the 9th animal in the zodica, meaning we will not see another Year of the Monkey until 2028. People born in the year of the monkey are said to be lively, quick-witted, curious, innovative and michevious. However, the year of the monkey is thought to be one of the more unlucky years in the Chinese Calendar. So the usual assumption of people born under the sign of the Monkey is one of success in career and wealth. But they are thought to be gentle and honest people, but have a short fuse and can be a little superior. Do you know which sign you were born under?